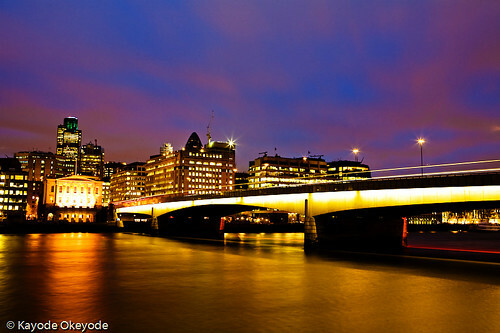 This is another picture of the London Bridge on Valentine’s Day (Day 45); I have cross processed it because it was overcast that day and my pictures came out with a reddish brown sky that I couldn’t get rid of despite shooting RAW. 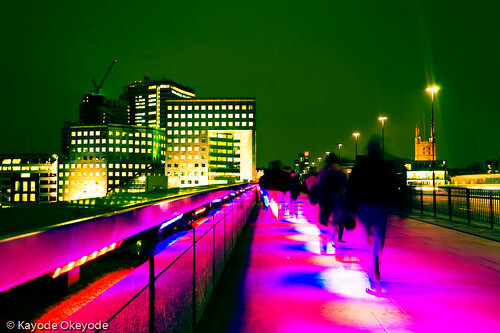 The color of the light flowing from the bridge and bathing the pedestrians has not been altered. The reason the color of the light is different from the previous picture is because the color changes every few seconds. 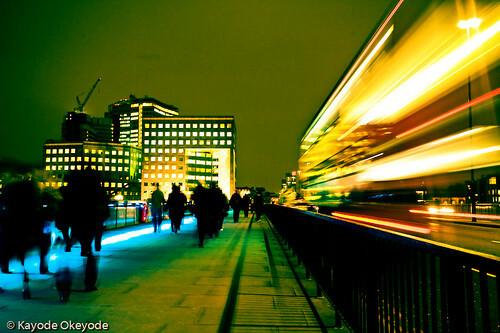 In retrospect, I should have used a faster lens and freezed the movements of the pedestrians . . . but the lights are all gone now so this is an idea to pursue next year. Switched on London is a lighting festival in the capital that aims to highlight the importance of sustainable lighting design in the night-time urban environment. A number of sites will be lit from February 7th – 14th in an energy efficient way to show the power of light in the city. This has been cross processed to get rid of the reddish brown sky. This is probably my first ‘proper’ twilght session since November 2007. The bridge is London Bridge in East London and I am facing the Financial District. According to WikiPedia, there has always been a bridge at this site for the last 2,000 years and an earlier version of this bridge was the only bridge over the Thames in London until Westminster Bridge was opened in 1750. The current London Bridge was designed by Mott, Hay and Anderson, constructed by contractors John Mowlem and Co from 1967 to 1972, and opened by Queen Elizabeth II on 17 March 1973. It comprises three spans of prestressed concrete box girders, a total of 928 feet (283 m) long. The bridge was built to be functional and long-lived, and, as such, it is noticeably less decorated than other Thames bridges.